These are the hallmarks of many of Pat Dall's ink resist paintings. For many years, Pat's painting took a backseat to the raising of seven children. About 14 years ago, with children grown and gone, Pat renewed her interest in art and discovered the five-step process of ink resist. She begins by drawing the image in pencil on watercolor paper and then uses white tempera paint to paint everything except those lines and areas that will be black in the final version. Once the tempera is dry, the entire paper is covered with black India ink. After the ink dries, it's off to the bathtub to wash the painting. The white paint, being water soluble, washes away, taking the overlying ink with it. Where there was no paint, the ink sinks into the paper and stays. The resulting image looks like a black and white coloring book and Pat then "colors" it with watercolor. 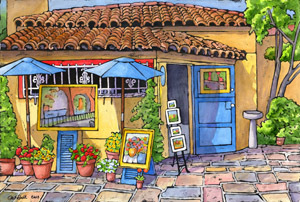 Many of her subjects come from Pat's travels with her husband to Europe and places in the U.S.. She also has done a lot of very detailed pen and ink with watercolor sketching on these travels. During the last few years, she has also studied oil painting with Marsha Wooley at Arapahoe Community College and enjoys the occasional change from watercolor that it offers. However, she sometimes uses a technique with her oils that resembles ink resist.